Lah (seated, centre) shows the document of the agreement between Long bedian villagers and the logging company. MIRI: Long Bedian chief Lah Anyie has brushed aside the claims saying that the logging company, which has been procuring timber from the area, does not honour the agreement between it and the local villagers. According to him, the company had made two payments, as agreed between the two parties, last year – the first commission payment of RM119,983.90 was made on March 21 last year, followed by RM216,763.30 paid on Aug 3 – both amounts were made payable to Long Bedian Social Welfare Body. Lah said this during a press conference yesterday, where members of Long Bedian Council of Elders and the Long Bedian security and development committee (JKKK) were also present. The press conference was held to explain to the public that the majority of Long Bedian folk disagreed with the protest and blockade run by a small group of villagers at the nearby log-pond recently, where they banned logging trucks from entering the zone. According to Lah, the company is deemed to have fulfilled its agreement, considering that the villagers have received their payments – including those who were part of the protest staged in front of the Forest Department Miri office a couple of days ago. He said the logging company had been taking timber from Long Bedian area, ‘just like any other companies that also operate there’. In this respect, he said the company entered into a negotiation with the villagers prior to its operations, and an agreement was signed between the two parties. 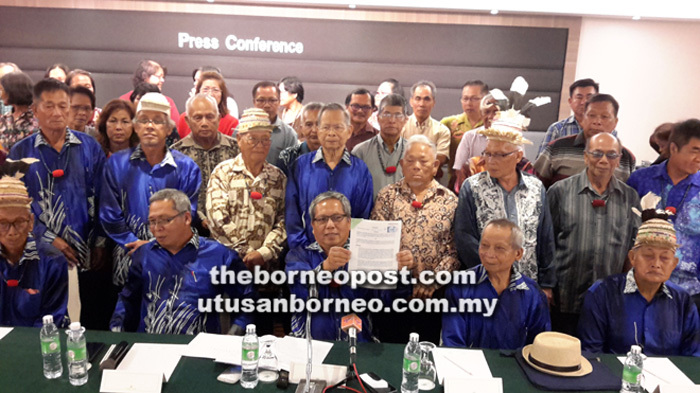 Lah said for this agreement, Long Bedian was represented by former headman Usang Wan and the JKKK, which also included those involved in the recent protest. “The payment (as per the agreement) was received by a representative of this small group. “In the 100-year history of Long Bedian, we have never had this kind of issue (blockade) – until lately,” said Lah, as he showed the media the agreement document signed by the representatives of Long Bedian and the company. Last September, a group of local villagers conducted a blockade to prevent a licensed logging company from bringing out logs from the Teben Camp, to the log-pond in Lubok Pinang Temala. Lah pointed out that with the issue having gone viral on social media, it presented a bad perception not only of the local folk, but also of Telang Usan assemblyman Dennis Ngau. He stressed that Dennis – whose late father Aban Ngau Jok once served as the deputy headman of the area – had been instrumental in the setting up and materialisation of the negotiation between the villagers and the timber company. “In the past, our former headman Tama Engan Sang and his deputy (Aban Ngau) had repeatedly advised the villagers against being hostile and unfriendly with the logging company operating in the area. “It is because of such positive attitude the Long Bedian has managed to progress like it is today,” he said. It is learnt that Long Bedian is home to 3,000 villagers.